Looking for a new way to cook cauliflower rice? I usually use it in my Cauliflower “Fried” Rice because I think the soy sauce (or gluten-free tamari) completely masks the flavor of the cauliflower, as it also does in my Cauliflower Rice Jambalaya, but every now and then I want a different flavor profile. This time, I decided to give the cauliflower rice a Mexican flair with this Mexican Cauliflower Rice Casserole. 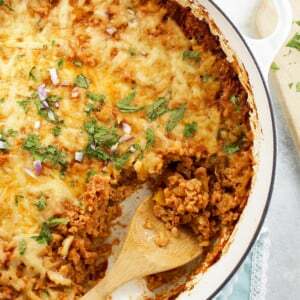 Vegetarian, but you can make it vegan if you omit the eggs and cheese or you can add meat, if you prefer. Make it your own! In this casserole, the cauliflower rice is almost reminiscent of taco meat thanks to its ground texture and spices. 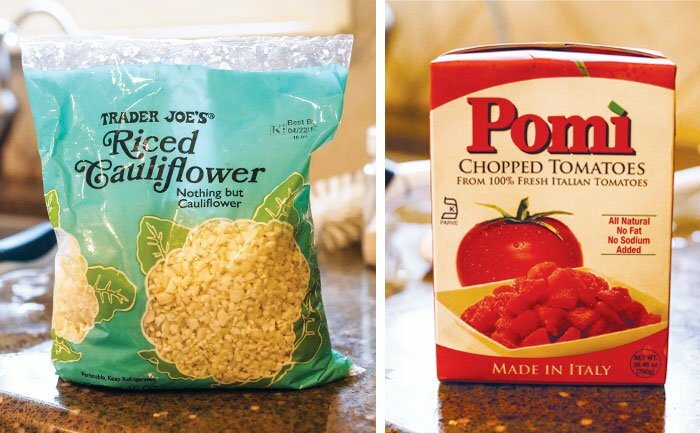 I used Trader Joe’s prepared Cauliflower Rice for convenience, but you can easily make your own by processing cauliflower florets and stems in a food processor, or grating them using the large holes on a box grater. I made this casserole using fresh tomatoes the first time around, but the flavor wasn’t nearly as good as the second time when I used a box of Pomi chopped tomatoes. I think the boxed tomatoes have a more concentrated flavor, which again helps to hide any “cauliflower flavor” that you might want to avoid, but feel free to use fresh tomatoes if they are in season where you live. To make this dish heartier and more casserole-like, I added eggs for protein and topped it off with a layer of cheese. It bakes to perfection for a comforting vegetable-packed meal, but if you’d prefer to skip the eggs and cheese, you can simply serve it as a Vegan Mexican Cauliflower Rice Stir-Fry once the vegetables are all tender. (It’s done a lot faster that way, too!) Perhaps top it off with a creamy sweet potato cheese sauce? Or a sprinkling of Cashew Parmesan? These dairy-free options would make it Paleo-friendly, too. 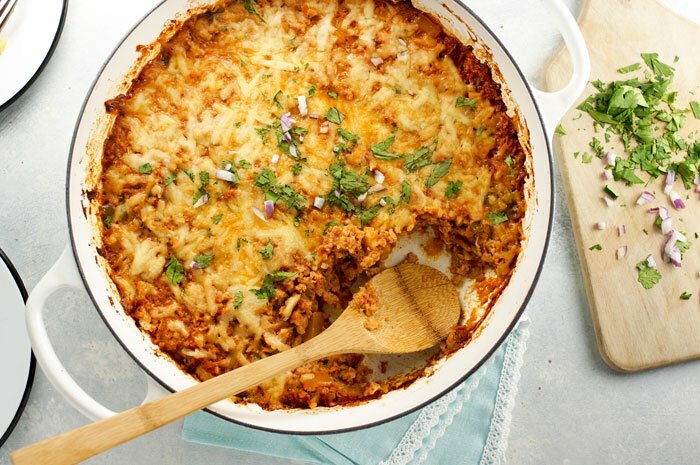 However you serve this Mexican-inspired cauliflower rice casserole, I hope you’ll enjoy it. 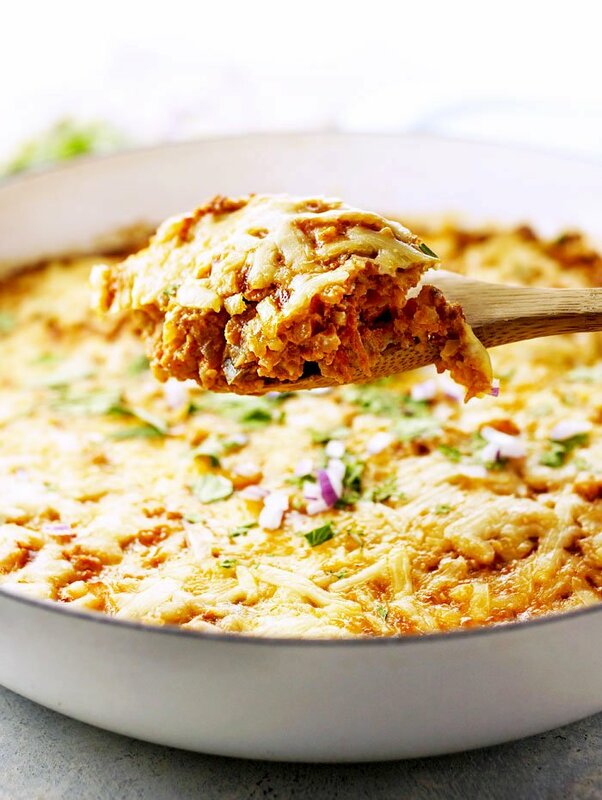 This Mexican Cauliflower Rice Casserole is an easy and healthy vegetarian skillet meal that uses Trader Joe's Cauliflower Rice, with Vegan and Paleo options. Preheat the oven to 350ºF. Heat the olive oil in a deep oven-safe skillet or Dutch oven over medium heat and saute the onion, bell pepper, and jalapeño until tender, about 10 minutes. Add in the garlic, cumin, chili powder, and cayenne pepper, if using, and saute for one more minute. Add in the chopped tomatoes, salt, and cauliflower rice and stir well. Once the tomatoes start simmering, lower the heat and cover the pan to let the vegetables cook until tender, about 8 to 10 minutes. Once tender, turn off the heat, remove the lid and give the vegetables a stir. Adjust any seasoning to taste then add in the beaten eggs. Stir well to make sure the eggs are well incorporated throughout the vegetables. Top with a sprinkling of cheese, then place the pan in the oven to bake for 30 minutes at 350ºF. 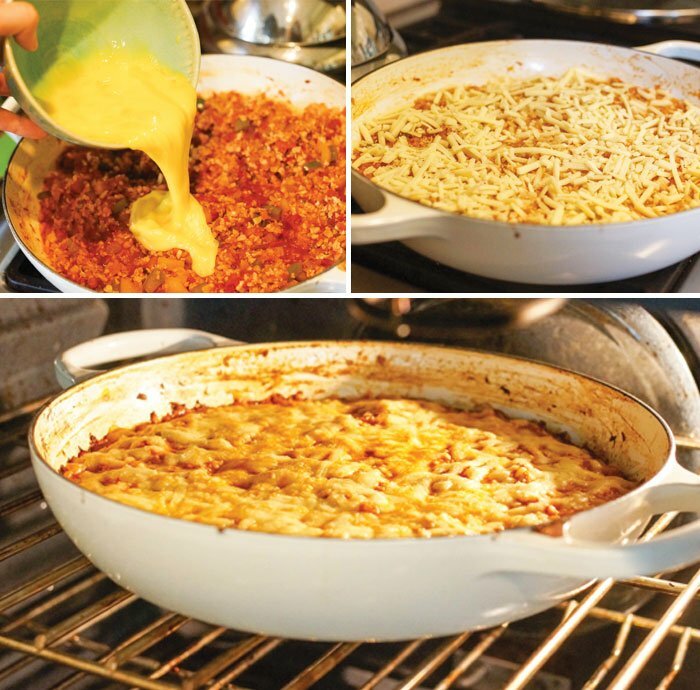 The casserole is done when the eggs are cooked through and the cheese is bubbly and staring to turn golden. Let the casserole rest for 10 minutes before serving. Leftovers can be stored in an airtight container in the fridge for up to a week. I haven’t tried this recipe using frozen cauliflower rice, but I would guess it would have a similar result to using the fresh version. Let me know if you try it! As always, if you try another other substitutions, please let us know in the comments below so that others can benefit from your experience. Reader Feedback: What’s your favorite way to cook with cauliflower rice? Yum! I will definitely buy the pre-made riced cauliflower next time…but for those making their own, 1 lb. of riced cauliflower is about one and half small/medium heads of cauliflower. I added black beans and will definitely do so again next time…so good! ! I also turned the broiler on for about a minute after the cooking time to brown/bubble the cheese a little more. can you use regular rice instead of cauliflower? Sure! You could swap it for cooked rice with no problem, but I don’t know what the ratio of raw rice and water would be since I haven’t tested it that way. If you don’t add eggs and cheese, do you still need to bake in the oven? Would you make any changes to this recipe if I added a pound of ground turkey? I’d saute it with the bell pepper, onion, and spices, and maybe drain the grease before adding in the cauliflower rice. I juuuust finished cleaning my plate of this recipe! It was great! I used an additional egg to help incorporate the 3 cans of low-sodium chicken I added. So delicious, can you! Hi! Do you think this could be made in a casserole dish instead? Thanks! Amazing…we were looking for a recipe that fit our home (one vegetarian, one GF and one keto (mostly))… Definitely a keeper. We used frozen Presidents Choice cauliflower rice and it was great. I would add black beans next time. Black beans are a great addition! This recipe was excellent!!! I doubled up the recipe and use one can of diced tomatoes and one jar of sweet basil tomatoe sauce. I also mixed one serving on cheese within the casserole before I put the eggs in. The second serving of cheese I sprinkled on top. For extra proteIn I chopped up some chicken pieces and cooked them on the side with fajita sauce. Once all was done I threw the chicken on top with some salsa, and sour cream. This recipe is my meal prep staple!!! I loved this recipe! I added about a pound of shredded chicken and 1/2 cup of enchilada sauce so it wouldn’t be dry. Flavors worked well together! I’ve made this recipe twice now, and I absolutely love it! As a vegetarian I feel like I eat a ton more starch than protein, so this is ideal to have in my rotation. I have eaten this for breakfast, lunch and dinner (not on the same day), and it always hits the spot. Sometimes I eat it with plantain chips (I can’t have corn), and it adds a nice salty crunch. Did I mention that I love this? I made veggie tacos and this as a side dish. Didn’t tell my husband it was cauliflowf and asked him, “did you like the rice?” He thought it was great and promptly ate the remainder the following day. Definitely adding this to favorites. I used some leftover whole cauliflower I pulsed for a a minute in my food processor. I used a can of diced tomatoes and only 2 eggs. Added a can of drained black beans and handful of cheddar cheese to the mix. Covered the top of the casserole dish with red salsa, diced olives (I o my had Kalimata on hand and they worked great) and another handful of cheese. Next time, I’m going to add diced green chiles to the mix and maybe cook the ‘rice’ in veggie bouillon broth. This recipe is also a wonderful base for experimenting with other flavor profiles. Tonight I going to make it with herbs and mushrooms with broccoli and Parmesan cheese. Layer, will make stir fry rice. So happy I have found a keeper replacement for rice!!! Hey Megan, If I omit the eggs, is the time of cooking in the oven the same? And can I use fresh cauliflower instead of the frozen version? If you omit the eggs, you could probably just saute everything on the stove until the cauliflower is tender and then put it under the oven’s broiler just to melt the cheese. This was excellent! I want to thank you for the recipe (I added mushrooms, poblano peppers, and some habanero salsa I made to it). This is going in the rotation, for sure. I’m wondering what the purpose of the eggs are in THIS RECIPE. are they a must? No, in this case they are just for more protein. Feel free to leave them out! I was feeling brave and made this for the first time when i had guests over 2 nights ago. It got great reviews! I really enjoyed it! Ive been eating simIlar to whole 30 for over a year and havent ventured INto Comforting casseroles until now and MY world is rocked! I made the cauliflower rice in my food processOr, easy peasy and yum! I made the recipe almost eXactly to yours with the exception of no JalapEnos and used a sprinkling of mexican cheese instead of goat cheese. Oh! And My inspiration for finding a casserole was my leftover roast chicken i shredded in my mixer. That was an excellent addition! MY large cast iron skillet was filled to the brim and fed us several times over 3 days. This dish is packed with nutrition and fills you up!! i love how its a one skillet mEal! I served it with a yummy little salad and thats all we needed:o) thank you so much for this creation! Is that like a can of diced tomatoes or just tomatoes that are chopped? It is like a can of tomatoes– the kind I use has no added sugar, so be sure to check labels! I just prefer to use the boxed kind to avoid can linings when possible. This sounds delicious! Do you think a can of green chilies would compliment the recipe? Maybe instead of the jalapeños? Can you make this again and freeze for later? If so, how would you reheat it? 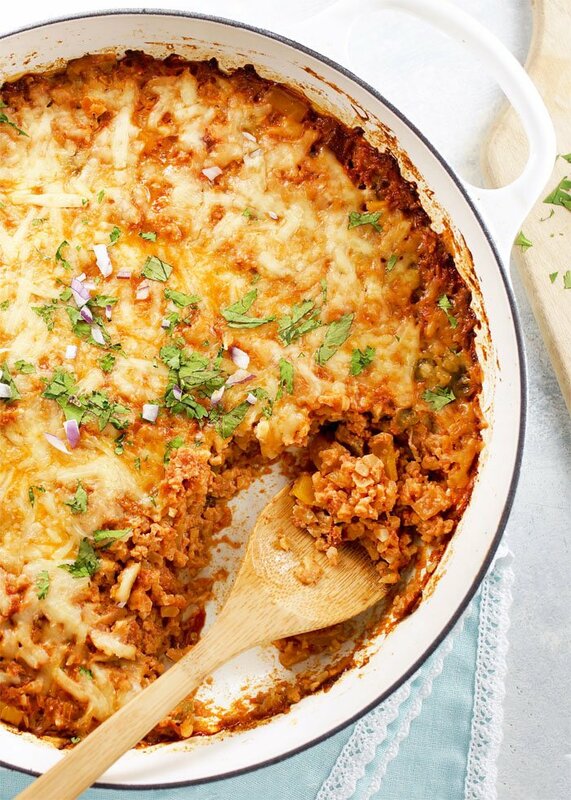 Thinking this would be a great make-ahead postnatal meal. Thanks! I omitted the eggs but added canned corn and a can of black beans. It was SO yummy! I made this for dinner just now with frozen cauliflower rice from TJ’s. It turned out great! I also added black beans, and used pepper jack cheese. Thank you for your wonderful recipes! This is yummy! I added black beans and a few black olives; garnished w avocado and it’s a killer casserole. I feel so much better when I cook your recipes and I’ve yet to find one we don’t like!!! Hi Megan, I love your skillet – do you mind sharing what type it is? Great recipe and tasty change for cauliflower!! Delicious! I seriously have the PICKIEST eaters (5 kids under 12 and a husband who is wary of too many veggies), and this was a success with everyone who was willing to taste it (can’t count the 2 littlest ones…they don’t like anything)! Delicious!!! This looks delicious! Do you think I can substitute goat cheddar cheese with Goat Gouda cheese (Trader Joe’s)? That is, the important part is that it’s from goat milk, right? Thank you! Yes, goat’s milk is easier to digest than cow’s milk. If you think you’ll like the gouda flavor with the Mexican flavors, go for it! Hi Megan! Where do you buy your goat cheddar? Whole foods usually carries the raw versions, but Trader Joe’s sells a pasteurized goat cheddar by the block, too! Sounds delicious! If adding chicken, would you cook it with the veggies before baking? Or cook it separate & then add before baking? Thanks in advance for the help! I’d just cook it with the veggies! Made this last night for dinner, using Trader Joe’s organic frozen cauliflower, sooo delicious. Was hoping for leftovers for lunch today, but that pot was wiped clean! Made this tonight for dinner. I loved it! I used frozen organic cauliflower florets and just sat them out on counter for a little bit to defrost then pulsed them to a rice in the food processor. I also used canned peeled organic tomatoes. It was perfect! Thanks again!! How many heads of cauliflour did you use? Would a VeganEgg (https://followyourheart.com/veganegg/) work in this recipe? It works well in basic egg recipes, like scrambling and baking. I am currently on an egg-free diet for health reasons. I wonder if replacing the diced tomatoes with salsa would give it a nice flavor and a little kick? I’ve substituted it in a lentil stew and it was a delicious exchange. Yes, I think that would be delicious! But in that case, I’d reduce the salt in the recipe since the tomatoes I used have no salt added, and salsa usually is already very well seasoned. This recipe sounds great, as usual! 🙂 Would you have any recommendations on an egg replacement for someone who is allergic? Thanks! I’d just leave them out!